Max, the adorable little black cat with the saucer eyes, is back and he’s ready for bed. But first he has a mission with a missing moon. 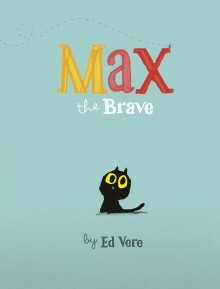 Did Ed Vere realise he was onto something with the creation of his inimitable supercat Max? Feted with critical acclaim and now officially a New York Times Bestseller, the ebony-furred feline has won hearts around the globe. And why so? Apart from his utterly charming ways, there’s an ugly truth lurking behind his fur. Max is not the sharpest tool in the shed – and that makes him even more irresistible. In this sequel adventure to Max the Brave, sleepyhead Max is going about the ritual of his nightly ablutions, saying his routine ‘Good nights’ to Fish, Box, Spider and Moon, when he notices something amiss. The moon has gone! So begins an epic odyssey through the night city scape, as Max heroically clambers across treetops and rooftops – he was Max the Brave in his previous carnation, after all – to the highest vantage point he can find. And still nothing. As Max cuts a rather sad and solitary figure atop “the highest of the high hills”, Wind takes pity and blows away the clouds to reveal a welcome sight. Set in shades of moody blues tinged with the modern phenomenon of ruddy ‘sky glow’, there’s heaps of delicious night-time atmosphere as Max ventures out. 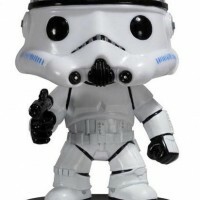 The perfectly paced narrative of the illustrations plays with perspective, one moment setting his diminutive figure against the vastness of the night, the next zooming in on his big face to show his emotional state (usually somewhere between endearingly perplexed and comically confounded). 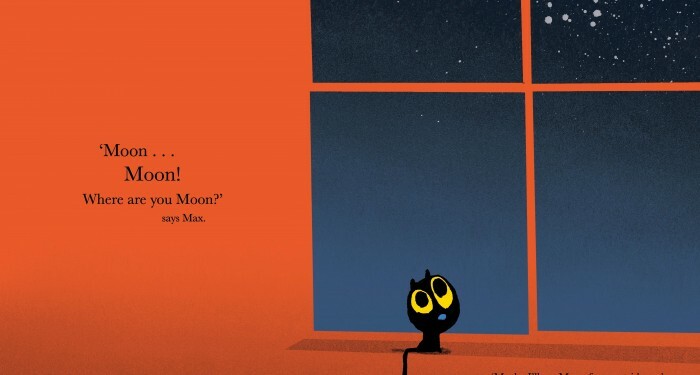 You have to admire Max’s endeavour and determination to find Moon – and sympathise with his frustration when, after all that, the poor exhausted kitty seems nowhere near getting his bedtime salutation. Isn’t it a relief to finally hear the calm, soothing words of Moon, who has a reassuring message – and Max can finally head off wearily, but happily, to his bed. An enchanting story that will strike a chord with anyone who loves the sweet familiarity of a regular bedtime routine – and definitely wants it to stay that way. Did you know? The colour of the night sky is changing. Scientists from the Freie Universitaet and the Leibniz Institute of Freshwater Ecology and Inland Fisheries explored the effect of cloud cover on sky glow in their 2012 report Red is the New Black. In places where natural light dominates the night sky, clouds typically make those skies darker. But the researchers found that the opposite is true in urban areas: clouds actually magnify the sky glow effect by reflecting more artificial light back down to Earth. 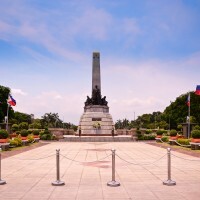 The result is that cloudy nights in urban areas have a reddish glow. 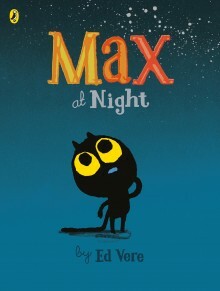 Author details Ed Vere studied fine art at Camberwell College of Art and has been writing and illustrating children’s books since 1999. His first picture book, ‘The Getaway’, won the Highland Children’s Book Award in 2007. His second, ‘Banana’, was shortlisted for the Kate Greenaway prize in 2008. His third, ‘Mr Big’ was chosen by Booktrust as the official Booktime book for 2009 and was distributed to 750,000 British schoolchildren making it the largest single print run of a picture book. His fourth, ‘Chick’, (a pop-up book) won the Booktrust Early Years Award for best baby book for 2009. Ed was the World Book Day illustrator for 2009 and the official illustrator for Hay Fever, Hay Festival 2009. His book ‘Bedtime for Monsters’ was shortlisted for the 2011 Roald Dahl Funny Prize. 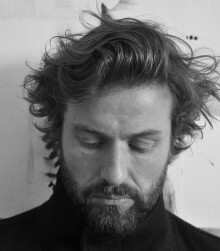 Ed is also a painter, working from his studio in East London and is represented by galleries in London and Los Angeles. After a year and a half living in Barcelona, Ed now lives and works in London.